Born in 1898, Henry was the seventh of eight children to a mining engineer father. After attending school in Castleford, Moore began modelling with clay and carving in wood which prompted him to become a sculptor at the age of eleven. In 1921, Moore won a scholarship to study at the Royal College of Art in London. There, he experimented with landscapes and animal figures but was led to the method of direct carving, in which imperfections in the material and marks left by tools became part of the finished product. After the birth of his daughter Mary Moore in 1946, his focus on the family was expressed in his "mother-and-child" compositions. 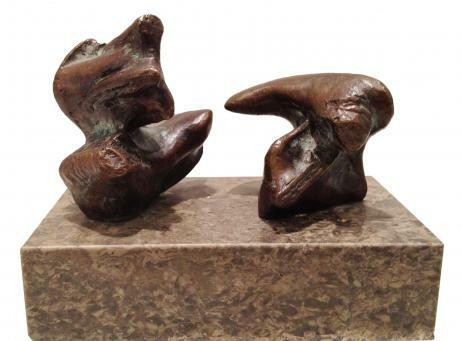 Moore made many preparatory sketches and drawings for each sculpture, many of which are his signature form of the reclining figure. He placed great importance on drawing; even when he had arthritis, he still drew. 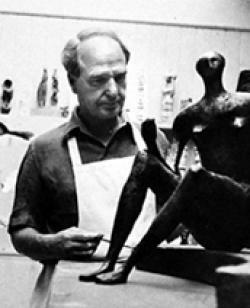 Moore continued to be the voice of British sculpture and British modernism even after his death in 1986.